Why Should I Get This Software Instead Of Some Other Software? Answer: The reason that the Cash Flow Mojo® software is so great for the business owner is because it does more than forecasting. It helps you build your budget, set your income planning target to do better than break even, and walks you step-by-step on how to accomplish that forecast. Whereas other software programs may just give you a forecast and you’re still unsure whether or not you can make that forecast. Cash flow is the most important resource a business has to keep it alive and growing. It’s the money that comes in, moves through the company and moves out to pay for what the company needs in order to keep producing income. It can be likened to being the fuel in the gas tank of the company. When the cash flow needle is hovering on the empty mark it is stressful, and the company cannot survive and pay their bills. That’s when they start getting into the credit debt trap. A business needs to have steady and increasing cash flow to promote, to pay its bills, to get off and stay off the debt carousel, to cover the annual increases in the cost of doing business, and expand and stay viable out into the future. A company cannot survive without adequate cash flow. It’s so important, that I developed the Cash Flow Mojo software to help businesses. How will a software product help my cash flow? 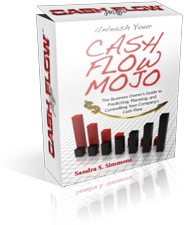 The Cash Flow Mojo software is designed to help your company’s cash flow in a number of ways. It calculates how much cash flow your company needs to be to do much better than break even. We call that the Income Planning Target. Most business owners under-estimate what their incoming cash flow needs to be by 13 to 25%. Next, it walks the business owner through a specific series of steps to plan out exactly how they are going to make that Income planning target each week. This is a very powerful tool. Then, it walks the business owner through the exact steps of how to allocate the cash flow that is received to the company’s best financial advantage so the business owner can actually achieve their financial goals. It manages the way a company gets out of debt, pays current operating expenses, and stashes cash flow in savings for future needs. Managed cash flow works harder, goes further and accomplishes more than cash flow that is spent without a plan. Does It Get the Cash Flow Results You Say It Does? Answer: The Cash Flow Mojo software absolutely gets results for business owners. I’ve had business owner clients that it has dug them out of debt, pulled them back from the brink of bankruptcy, and even with some business owners who make so much money that they end up wasting most of it, it has put the discipline in so that they can achieve all of their financial goals too. Why the software is called Cash Flow Mojo®? The word mojo means magical powers. The Cash Flow Mojo software product is an incredibly simple but amazingly powerful tool that makes a cash flow plan. It has dug companies out of debt and pulled them back from the brink of bankruptcy, and it works like magic when the business owner uses it on a weekly basis without skipping steps or changing the procedure it lays out. That’s why I decided to call the software Cash Flow Mojo. The business owners who use the software and keep the weekly discipline in say that if they had had this cash flow software 10 years earlier to follow the cash flow formula, they would be millionaires. Cash Flow Mojo has the power to do that. Does This Cash Flow Software Do A Cash Flow Budget and Forecasting? Answer: This cash flow software doesn’t just do cash flow forecasting. It actually builds a budget and it has templates in it that gives you your actual income planning target that you have to make each week to do better than break even. It has a cash flow calculator in it so that you can figure out exactly what actions you are going to take to make that income planning target. And it lays out a cash flow plan step-by-step that get you to a point that you can accomplish all your financial goals. What does the Cash Flow Mojo software do? First, the Cash Flow Mojo software is a cash flow calculator that figures out the amount of cash that the company needs to bring in on a weekly basis to pay its operating expenses, to plan for the future needs of the business, and to get money stashed away in savings for wealth building. In other words, to find out what the Income Planning target needs to be to do better than break even. Next, it has a sales and income planning module that helps the business owner work out the cash flow formula of exactly how they are going to make that Income planning target each week. Then, it has the simplest, bust most sophisticated cash flow spreadsheet called the Cash Flow Controller. It’s a master cash flow statement template, that walks the business owner through the exact steps of how to allocate the cash flow that came in to pay the operating expenses, pay off debt and get cash stashed away in specific savings accounts that we call “buckets of cash” with each bucket designated for a specific purpose. It helps get the income up and it helps keep the discipline in to use the income to the best financial advantage of the business. Why did you develop the software Cash Flow Mojo? I developed the Cash Flow Mojo software for a very specific reason. I’ve seen businesses that make a lot of money, then handle the cash flow incorrectly and struggle to survive. I’ve also seen companies that make very little, yet they handle their cash flow correctly and do quite well. The step that is missing is having a cash flow plan and a cash flow projection tool to walk you through the steps. This type of cash flow software is not available anywhere else, and what it does in terms of planning, projection and management isn’t taught in any school curriculum, so it isn’t that the business owner slept through the class. Business owners need to know how to do cash flow planning and management correctly. I used to coach business owners on how to do it using cash flow spreadsheets, checklists and notes I had written, but that limited how many business owners I could help. I decided to develop a software tool that runs like an automated cash flow template so that business owners could learn and do their cash flow management on their own and in a minimum amount of time each week. I still do one-on-one coaching for those who have a serious situation that they want help with, but the subscribers to the Cash Flow Mojo software get group coaching on a regular basis. Is The Cash Flow Mojo Software Better Than the Other Cash Flow Software? Answer: The Cash Flow Mojo software actually has some features that the old software doesn’t. One feature in particular is the sales and income planning module, which is a tool that the business owner can use to map out exactly the actions they’re going to do in their business that week to make their income planning target. How does the Cash Flow Mojo software help me establish a cash flow budget for my business? The Cash Flow Mojo software has a cash flow budget building tool that is very simple to use. It goes a few steps further than your average cash flow spreadsheet. It’s an automated budget tool. Most business owners hear the word budget, and immediately think it means belt-tightening and denying themselves anything fun. That is not the correct definition of a budget. keep up with the annual increases in the cost of doing business, and get cash into savings to expand the company and make more money. We also call this the Income Planning Target. The Cash Flow Mojo software walks the business owner through the simple steps of building their cash flow budget to get to their correct Income Planning Target. How Easy Is It To Work With The Software? Answer: This software is incredibly easy to work with. You can just log in online, it’s completely web based. You can watch the built in training videos. In less than two hours you’re up and running. And then you can do your planning in less than 20 to 30 minutes a week. How does the Cash Flow Mojo software pay bills? The Cash Flow Mojo software actually has a tool that helps the business owner decide which bills to target for payment each week. The software is a simple cash flow plan and it’s a cash flow management tool, not a record keeping system like an accounting program. First you plan which bills to allocate some cash flow to paying, then you execute the plan, and finally you record the execution in your accounting program. The accounting programs are just recording what happened with the money in the past so that your accountant can print out financial statements in order to prepare your tax returns. The Cash Flow Mojo software is a planning tool that operates in the present and plans out the present and future use of cash flow. That planning is done BEFORE the cash flow comes in and BEFORE it is spent. How does the Cash Flow Mojo software create a cash flow formula? The Cash Flow Mojo software creates a cash flow formula using a series of simple modules that are steps in the process of building a cash flow plan. It starts with the most important part of the cash flow formula – how much the budget, or Income Planning Target needs to be. It moves through a plan on how to increase the company’s income to make the Income Planning Target each week. And finally the Cash Flow Mojo software walks the business owner through a cash flow template called the Cash Flow Controller. It’s a cash flow formula in a simple series of steps to best decide how and where to spend the cash flow that arrived to the company’s best financial advantage. Is the Cash Flow Mojo software a cash flow calculator? The Cash Flow Mojo software is much more than a basic cash flow calculator. It is a cash flow management and planning tool. That means that one of its cash flow calculator functions builds a budget correctly. Other cash flow calculators in the cash flow software helps a company boost their income and profits, get out of debt, get cash into savings for business expansion, protection, and wealth building, and to use their cash flow to actually achieve the financial goals of the business owner. The Cash Flow Mojo software moves the business owner away from being controlled by how much money is in their bank account, to being in control of their money and their financial destiny. And that is how it should be. What Is So Good About This Cash Flow Software? Answer: The Cash Flow Mojo software lays out the complete plan for a business. And not only that, it walks the business owner step-by-step through how to accomplish that plan. Why should I have a cash flow plan for my business? Every business owner should have a cash flow plan for their business. They need to know for certain how much cash flow they need each week, how to make that cash flow income target, and what to do with the cash flow once it has cleared the bank that will help them accomplish their financial goals. Not one business owner I ever met said they only started their own business to pay bills and make their suppliers wealthy. Most business owners were taught a smattering of accounting concepts because they have to know them in order to file their taxes and stay out of the gun sights of the IRS. No school teaches cash flow management and planning. That puts the business owner in a position of being controlled by how much money is in their bank account, when it should be the other way around. With the Cash Flow Mojo software, creating a cash flow plan is not only simple and fast to use, it walks a business owner step-by-step through the process and puts them firmly in control of their cash flow and their financial destiny. You see, it’s not only how much money you make. It’s what you do with it that determines your financial condition. The “what you do with it” part is the cash flow plan, and that can be figured out in about 20 minutes a week in the Cash Flow Mojo software. Will the Cash Flow Mojo software make a cash flow projection for my business? The Cash Flow Mojo software excels at making a cash flow projection for a business because it includes things that the typical cash flow projection tools forget. It builds a real cash flow budget. One of the most important pieces of information in the cash flow projection is how much cash flow they need each week to do much better than breaking even, and then how they are going to boost their income to make that cash flow projection target. A cash flow projection isn’t just how much cash flow the company can expect to make and spend. get cash into savings to expand the company and make more money. We also call this cash flow projection the Income Planning Target. The Cash Flow Mojo software walks the business owner through the simple steps of building their cash flow budget to get to their correct Income Planning Target. Are there cash flow statement templates available with the Cash Flow Mojo software? The Cash Flow Mojo software is a series of very simple, easy to use cash flow statement templates that are based on a cash flow formula that builds a cash flow budget. The budget tells a business owner how much cash flow they need to do much better than break even. Other cash flow statement templates in the software walk the business owner through sales and income planning so they have the best chance of boosting their income to the necessary level, and templates that walk the business owner step-by-step through the process of allocating the cash flow that is received to pay off debt and past due bills, pay current operating expenses, and get money into cash savings for emergencies, business expansion, legal defense and taxes, and long term wealth building. What Kind of Results Have People Gotten With This Software? Answer: This software is in use in over 50 industries by business owners around the world. And business owners have talked to me and said that they were 180 days out in past due bills and had no cash savings. And within 3 to 6 months, not only were they current on their bills, but they has savings in the bank. What is your experience in working with cash flow software and cash flow for businesses? Throughout my career I have been working with and learning about cash flow for businesses. In the beginning I was helping companies bring cash flow into their companies through marketing and advertising. I helped companies make multi-millions in cash flow, only to watch them waste a lot of it. In 1994 I shifted my focus to working one-on-one with business owners to teach them cash flow projection, planning and cash flow management. I was doing that with cash flow spreadsheets, checklists and notes. I was limited in how many business owners I could help with their cash flow because I could only spend so many hours a week working one-on-one. I decided to develop a cash flow software program so that business owners could do their cash flow projection, planning and management on their own. I launched my software in 2006 and it is now in use in 25 countries around the world in over 50 different industries. I recently moved my Cash Flow Mojo software to an online platform so that a business owner could log in and use the cash flow planning tool wherever they had a computer and an internet connection because so many business owners are working in the field or travelling in their business week. I have received numerous testimonials from business owners who have used my cash flow software it to dig their companies out of debt, pull their business back from the brink of bankruptcy, expand their companies and create new jobs, and achieve the financial goals that they had when they started their companies. My cash flow software users are no longer at the mercy of what is going on in the economy around them. They are no longer controlled by the balance in their bank accou8nt. They are firmly in control of managing their cash flow and in control of their financial destiny. And they are sleeping really good at night with plenty of money in savings accounts that we fondly call “buckets of cash” that they are filling up by using the Cash Flow Mojo software program. Where And How Do Businesses Use Cash Flow Management Software? Answer: I created a cash flow management software program called Money Management Solutions about a decade ago and it’s in use in 24 countries worldwide by business owners. The reason that I changed to the Cash Flow Mojo software is because it’s web based, so that a business owner who travels, or wants to work on their cash flow management at home, can simply log in from any computer anywhere in the world that has an internet connection and they can work right in the software. Q: Is the Cash Flow Mojo software program easy to learn? Yes, the Cash Flow Mojo software is very easy to learn because there are training videos built right into the software. You can be up and running and through the training on your first cash flow planning cycle in as little as two hours. After that, your cash flow planning can be done in 20 to 30 minutes each week. Q: How does your business cash flow management software differ from accounting systems that help with cash flow and money management? You use the Cash Flow Mojo software for your cash flow management planning before you use your accounting software like QuickBooks®. Cash Flow Mojo is a cash flow management and planning tool that operates in the present and also helps you plan for the future. Your accounting software is a recording tool that records what happened with the money in the past. It tells you how much money came in, and where it was spent after the fact. The primary use of accounting programs is to generate reports that are used to prepare tax returns. Q. How does this software work with my accounting software? The Cash Flow Mojo software will download your unpaid bills from versions of QuickBooks® Pro that can export reports to Microsoft Excel® spreadsheets; otherwise the bills can be entered into the Cash Flow Mojo software program manually. Q. Is the software program available in any country? Yes, it is available in the English language on the internet and is available to anyone who has access to the internet. The Cash Flow Mojo software is an online program that is used right on our website. Q. Does the software work with a PC, or Mac, my iPad or Tablet computers? Yes, it works on any and all of them because it is a web-based online program available to use right on the internet. Q. How many users can be using the software at one time? Each Cash Flow Mojo subscription for one company can have 3 users – for example – you, your accountant, and your bookkeeper. Q. When is the monthly fee deducted each month? Your credit card on file will be charged the current monthly subscription fee on a monthly basis on the anniversary date after you initially signed up for the 30 day trial. Q. What happens with the software after the 30 day trial? Your credit card on file will be charged the current monthly subscription fee on a monthly basis on the anniversary date after you initially signed up for the 30 day trial. If your credit card is declined, or if you cancel your subscription, all of your records in the system will be deleted after 5 days. Q. What if I want to use the software on more than 1 computer? That is not a problem because the program is web-based and you can access it on any computer from anywhere you have an internet connection. Q. What do I do if I lose my password? When you arrive on the login window there is a link to use to retrieve your password. The system will email it to you at the login email you used when you subscribed to the program. Q. If I want to use the software for another company, how do I do this? Purchase another software subscription for the monthly subscription fee. You will need to use a different login email address for the second company. Q. How can I save my financial data separate from the software? You can print reports right from the software in PDF form to save on your computer or you can print to paper files. Q. Can I go back and review my saved records? Yes, as long as your subscription to the service is active, you can move to previous cash flow planning periods in the online software to view your records or print them as PDF files to save to your computer or print as paper files. Q. Will I be able to use the program on a weekly, bi-weekly, semi-monthly, monthly basis? We have found that it is best to do your cash flow management planning on a weekly basis because you run might tighter control on the money. Therefore the Cash Flow Mojo software is set up to only do weekly cash flow planning. Q: Will there be coaching available? There is complimentary group coaching available on a regular basis for all current subscribers. This is in the form of a teleconference where the moderators will answer questions received by email from subscribers who are working in the software. If one business owner has a question, then all subscribers can benefit from hearing both the question and the answer.